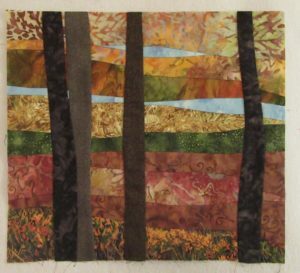 While teachin g and training was part of my professional career before retirement, since I started making art quilts I have shied away from doing this. I have done the occasional trunk show for quilt guilds, traveling a few hours away to meet new quilters. Often at those show and tell events they ask about workshops, some “how-to” sessions about the quilts I make. 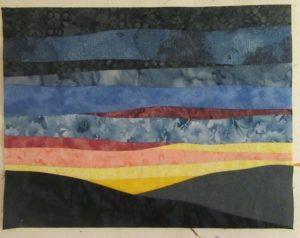 The challenge of teaching a group how to make these improvisational quilts with no patterns has kept me studio bound. I don’t want to teach how to have us all make something the SAME. Even quilts with similar designs in my own studio are not the same because I don’t use patterns. How to teach? Late last fall I did a trunk show in one of my rural counties. This group just would not accept NO for an answer when it came to a workshop. I thought perhaps it was time to take the next step and try to structure a workshop around one of my common design features – curved piecing. 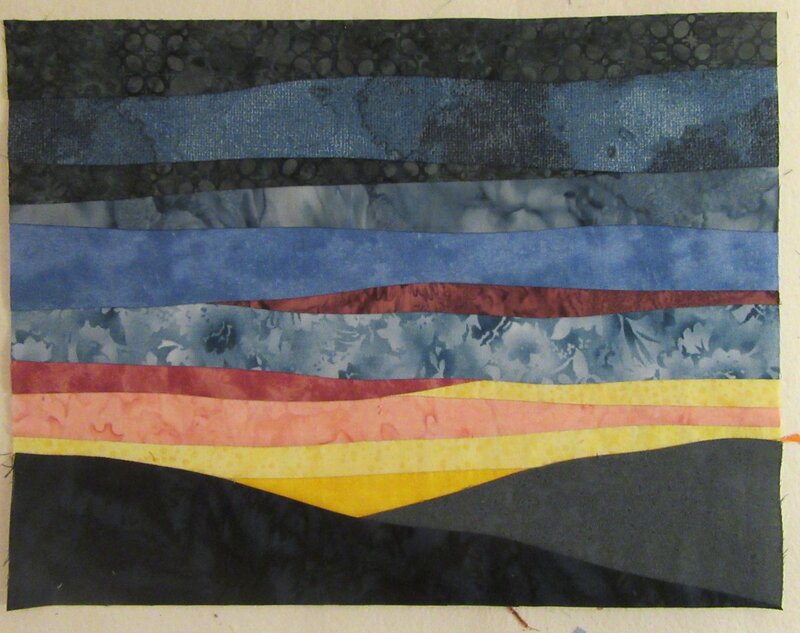 I am scheduled to do a 3 hour workshop on “Curved Piecing” on May 20th for the Juniata County Quilt Guild. In December, a typically slow month for me, I drafted this workshop. In early February some wonderful local quilt friends are going to be my guinea pigs for a trial run to be sure I have my timing and teaching figured out. I’m giving the workshop participants a choice of three design motifs AND encouraging them to pursue lots of creativity within those options. 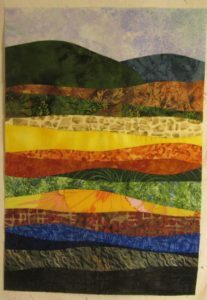 They can make an abstract landscape quilt, a sunset quilt, or a tree quilt I have pictures included in this blog of the three sample quilt tops I have made to show them. These quilts are all small, about 1 – 1.5 square feet total or around 10″ x 14″ or 12″ x 16″ when finished. Each will have about 10-12 curved cuts and sewing seams. I’m getting very excited about the workshop and who knows….maybe part of this retirement business will be teaching in addition to creating! !